Can Cancer men and Scorpio women have a successful relationship that is compatible mentally, emotionally and sexually? The Scorpio Woman is the perfect combination for the Cancer Man. Though Cancer man and Scorpio woman might have different energy levels, they are similar personalities and have the same desires. The Scorpio Woman will be the dominating one in the relationship, but the Cancer Man needs someone to break him out of his shell and fulfill his deepest desires. Two Zodiacs under the water sign are bound to mingle well together. The Scorpio Woman is very passionate and will be willing to feed the emotional side of the Cancer Man. The Cancer Man looks for someone who can show love through physical sexual affection and the Scorpio Woman is able to overload his senses with love. The Cancer male never has to be jealous of his Scorpio mte gaining the attention of others because she will enjoy spending time at home just as much as him. More than likely, she will be the first one to become jealous in the relationship, which is hard to do as the Cancer Man who doesn’t venture out much. The Scorpio Woman possesses the same amount of intuition as the Cancer Man does. She will be able to recognize his changing moods quickly and be able to feed them back into a balance. There isn’t another person in the Zodiac that will be able to understand the deep feelings of the Cancer Man like the Scorpio Woman can. She is the ultimate balance to his life. Another great aspect about the Cancer Scorpio relationship is that she is good in investing where the Cancerian is great at balancing finances. Money will never be something these two will be worried about. The Scorpio Woman is the Cancer Man’s fantasy come true when it comes to the relationship in the bedroom. She is full of passion and will be able to be intuitive to his needs and wants. He in turn will be able to love her on a deeper level than any other Zodiac sign. They will never get bored in the bed room as the Scorpio Woman will never miss any of the signs the Cancer Man is trying to give her. The Cancer Man and Scorpio Woman relationship is truly one devised in Heaven. They will be able to balance each other out and commit to a long lasting marriage. Cancer Man And Scorpio Woman Love Compatibility. A Solid And Compatible Partnership That Is Intuitive, Emotional As Well As Spiritual In Nature. The one thing the Cancer Man will have to look out for when it comes to his Scorpio Woman is her potential of vulnerability. She often appears very tough on the outside but she is as soft as he is on the inside of her shell. The Scorpio Woman has trouble forgetting anything and will often remember other times she has been hurt. From time to time, the Cancer Male will have to watch what he says in order to prevent an outburst from her. Good thing the Cancerian’s intuitive side will help in this particular situation. Cancer is a water sign that is cardinal and Scorpio is a water sign that is fixed by nature. 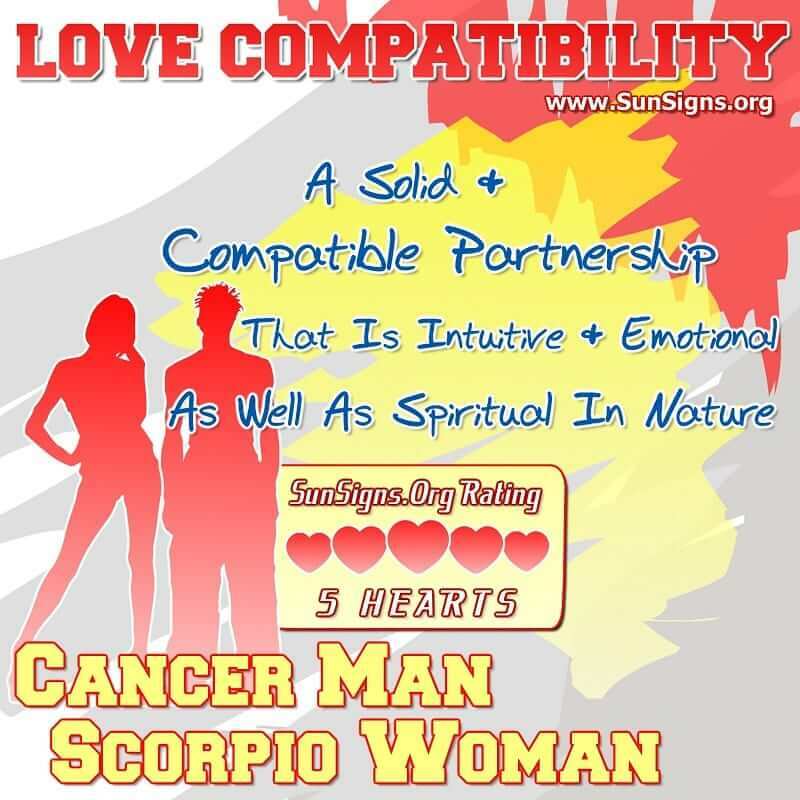 The Cancer man Scorpio woman compatibility gets a FIVE Hearts love rating. Scorpio Women bring passion to the relationship while Cancer Men are able to bring balance to both of their emotional sides. She is the only one capable of giving true love to the Cancer male that he is constantly seeking for. The Cancer and Scorpio couple want and desire the same things. Together these two are in separable once woven closely together. They work on breaking each other out of their shells and taking on the world together. Why Is He Afraid To Love Me?